St. Paul Parish of Highland, IL is but a few years younger than Highland itself. In December 1843, the Catholics in and around Highland (a village of 60 families) decided to build a frame church. The cornerstone was laid on May 1, 1844 and was ready for occupancy in 1846. In 1854, a new brick church was built and on Easter Sunday, 1856, the first services were held. In 1951, the second church was razed to make room for a much needed larger church with a seating capacity of 800. 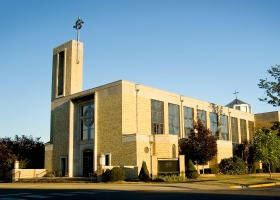 On October, 12, 1952, the dedication of the present church was held. Through the years, St. Paul’s has grown to meet the needs of its congregation. Today, the parish serves more than 5,000 area Catholics. St. Paul School provides Catholic education of children from pre-school through eighth grade. The current grade school was constructed in 1956, with a major renovation in 1993. In 1995, the former St. Paul High School building was renovated to better serve St. Paul Parish. It is now known as the parish center, St. Paul Hall.The building is now used for the Religious Education Program, meetings, parish gatherings, gymnasium, and cafeteria.